If you missed the first beta version of Update Aquatic then its description is here - Minecraft PE (Bedrock) 1.2.13.10. One of the features is a trident that possesses all the properties of a laser Jedi sword. The creator of the addon had to make some small changes and eventually this wonderful addon appeared. It has an interesting feature that is the ability to throw a sword like a boomerang, which means your sword will return to your hands if you use a new enchantment. 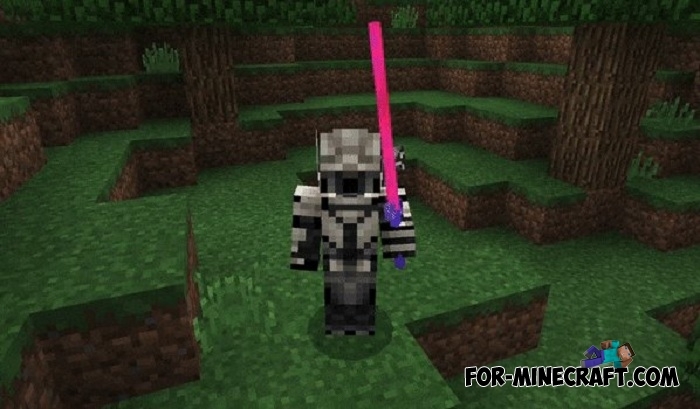 How to get a laser sword? Open the creative inventory and find the trident. Throwing it or attacking the enemies you will hear the appropriate sounds. To make the sword come back you need to add the enchantment is loyalty. After that, try to throw the sword and see how it returns. How to install the Laser Sword addon?